In the relaxing comfort of our waterfront salon, located in the pleasant atmosphere of Nelson’s Dockyard in English Harbour, Antigua, our experienced team will take great care of you. Our team of dedicated professionals take the business of beauty, hair and massage very seriously. We ensure that they are trained in the latest techniques and therapies to provide you with a first class service, whether you live in Antigua or are on holiday; spending a few days or weeks here, or cruising around the islands on your yacht. 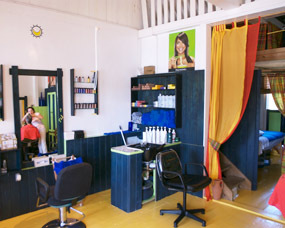 Located upstairs in the Georgian-period Officers' Quarters, our salon is a beautiful, breezy environment with a spectacular view of Freeman’s Bay. It's the perfect place to sit back, relax, and be pampered for an hour or two - or maybe an entire day.